These are the physical books I already own that I vow to work through during 2019. As I read them I will cross them off and if I buy more I will add those in bold. Who doesn’t love a good series? Here you can see my ever changing list of book series I want to read. I will add when I find new ones to enjoy and let you know when I have finished others. I have read so many wonderful books this year that I have broken my favorites into Ten categories with a Winner and an Honorable Mention given. If you want more information I have added a link to any original review. 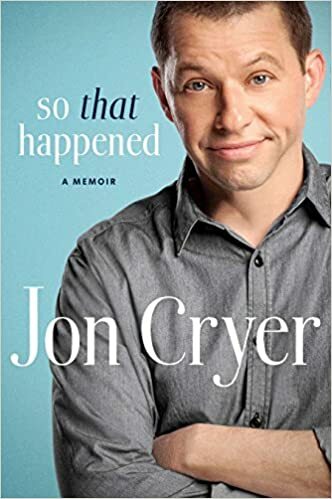 Winner: So That Happened by Jon Cryer. My nine hours spent listening to Ducky (I mean Jon!) talk about his youth and experiences felt far too short. He is dryly funny and deeply interesting and it stands out as my absolute favorite audiobook of the year. Honorable Mention: Stuff Matters by Mark Miodownik. This audiobook had the delightful ability to keep me interested in a subject matter that probably would have put me to sleep otherwise. Read in a clipped British accent that drives the information directly into your brain and featuring a perfect blend of history and science Stuff Matters will make you the most annoying or fascinating party guest, depending completely on your audience. Read the room before you launch into the history of plastics! Winner: Bob by Wendy Mass and Rebecca Stead is the early middle grade book everyone should read. A story of what it means to be a friend is always important but Bob brings subtle layers to the friendship between the sweet Bob and his Livy. Honorable Mention: The Seventh Most Important Thing by Shelley Pearsall. This book was part of a book club required reading and, although I was determined to hate it, I cannot love it more. A redemption story through the recognition that things are not always what they seem to be was a wonderful theme for 2018. Winner: The Prince and Dressmaker by Jen Wang is hands down my best graphic novel of 2018. The story didn’t match my prediction based on the cover at all. Instead it was so much more. If you want a story about being true to yourself and what it means to accept someone, look no further. Honorable Mention: The Chilling Adventures of Sabrina by Roberto Aguierre-Sacasa. I read this series during my month of Frighteningly Good Reads 2018 and it is amazing. If you have already peeked at the Netflix series and liked what you saw then you will also love these books. I do not enjoy horror stories but this dark turn on Sabrina was just the right combination of horror and storytelling for me. Winner: The Lord of the Rings, Return of the King by J.R.R. Tolkien. Perhaps this book lands on top of my fantasy experiences for the year aided by the satisfaction of finishing the trilogy but I don’t think so. This was, hands down, the best of the trilogy for me and the last 100 pages were so action packed and then sweet that I will always remember reading this with joy. Honorable Mention: Iron Gold by Pierce Brown. Beginning this book was difficult. Not simply because it is a hefty 601 pages but because we left the characters at the end of Morning Star at relative peace. Ten years later we find them….still fighting. But, in true Pierce Brown manner the character building and action climb together until you close the book and find yourself wanting more. Winner: Circe by Madeline Miller. I tried to limit my expectations after reading and falling deeply in love with Song of Achilles but Madeline Miller absolutely exceeded even my (secret) wildest expectations. You have seen the book in every store and heard everyone talking about it for a reason – it is perfect. Honorable Mention: The Storied Life of A.J. Fikery by Gabrielle Zevin. I bought this book because it has a bookstore on the cover. I started reading it because it was alphabetized last on my TBR bookshelf. And I love it because it is a beautiful story that shines a light on the how books weave into the fabric of our lives and those we love. Winner: The Watchmaker of Filigree Street by Natasha Pulley. This was one of the first books I read in 2018 and it remains my absolute favorite. It is the overall winner of every award for me in every category but I placed it here because, technically, it is historical fiction. This beautiful sweeping story takes you back and forth between London and Japan and volleys between historical facts and fantastical fiction. This is the book that owned my heart in 2018. Honorable Mention: The Alice Network by Kate Quinn. I started this book and misplaced it. It is a testament to the writing and characters in this book that when I found it again I was able to immediately sit down and continue reading without missing a beat. This story features a number of strong women as they help the war effort and pick up the ravaged pieces of the world. As two story lines, one from WWI and one from post-WWII, begin to intertwine the rising action took on a break neck pace. This adventure is one I was thrilled to see unfold during 2018. Winner: Awkward, The Science of Why We’re Socially Awkward and Why That’s Awesome by Ty Tashiro, PhD. This was not only an excellent book but also stands as my most often quoted book of 2018. Where was this book when I was an awkward nerd in sixth grade?!? As an awkward adult I enjoyed seeing the growth potential and the previously unknown benefits of my awkwardness. As someone who works with children I love recommending this book to naturally socially adept adults. You know, those who have never stood outside the circle just wondering how all the talking happened. Awkward people unite! Honorable Mention: Canada by Mike Myers. I have a deep and abiding crush on Canada. I cannot say I love it yet. I found myself first attracted to Canada several years ago. I finally took my first trip through Quebec this year and so my crush is still blooming. But, true knowledge is what leads to love. Mike Myers has that in spades for his native land. Part autobiography part history of Canada and all fabulous this book was perfect for feeding my fascination with Canada. Winner: Marriage of Inconvenience by Penny Reid. This is the seventh book in the Knitting in the City series and features (finally) Kat and Dan’s story. Penny Reid introduced both of these characters in book one and has allowed the readers glimpses of their infatuation and love in brief moments through the series. The hype about finally seeing them get together was high. And, the book delivered! The female characters Reid creates are interested and her books always have truly smart quirks. I was as happy to finally read Kat and Dan’s story as I was sad that the series was over. Honorable Mention: The Kiss Quotient by Helen Hoang. This book received an unbelievable amount of hype in 2018 and, deservedly so. It was the most surprising contemporary romance I have read since Sally Thorne’s The Hating Game. This gender swap on Pretty Woman is made more interesting by the author’s ability to simultaneously feature culturally varied characters and characters with disabilities without making the reader feel like they are being lectured. Winner: Warbringer by Leigh Bardugo. This is part of the DC Icons series. I may not have always been a fan of the scantily clad Amazon but after Gal Gadot I became a dire hard fan. Leigh Bardugo’s retelling of Diana’s beginnings as Wonder Woman was a perfect mixture of cannon and invention and I loved it completely. Honorable Mention: Foolish Hearts by Emma Mills. I do know normally enjoy books set in high schools. However, I received Foolish Hearts from an OwlCrate and those books are always enjoyable. I was delighted to find that, while this was a romance of sorts, it was mostly about falling in love with yourself and growing as a person. This book also featured genuinely positive examples of both female and male friendship and I ate it up. Winner: Ten Dead Comedians by Fred Van Lente. Ten comedians are locked on an unpopulated island and one after another they die…horribly. Fans of Agatha Christie’s locked room experiences will enjoy this modern twist. The added bonus of comedy’s more recently defined “unacceptable” lines left me constantly guessing as to the real identities of the fiction dead jokesters. What are your favorite reads from 2018? It is a classic story for a reason. I have always meant to read the books and when I saw Ryan reading them this year I was inspired to pick them up and enjoy the journey. This is the portion of the story that I am most familiar with. Sadly, there was a lot less of Legolas than I wanted. Also, the book has a LOT of singing. I really struggled with the songs because I kept singing them to the tune and tempo of a sailor’s ditty. Just imagine it with a little harump and accordion workings. Nasty Hobbits. All in all I did feel that the first book went fairly quickly. I ended it feeling smug and determined to just zip through the entire series. “Just twenty pages a day!” I told myself. Hah! Book Two: The Two Towers. This book took me, literally, four months to finish. This is the book that separates the reader from the determined fan. If I could get my hands on those Ents I would tell them to hurry the hell UP. This book is slow and you really start to feel the fatigue of the massive journey. It doesn’t help that throughout the second book you meet countless new characters and, frequently, each character has multiple names. It begins to feel like a fantasy version of War and Peace and I regretted not making a chart. At one point I think I sleep-walked and hid the book from myself. I have never been more thrilled than when I closed the second book. Book Three: The Return of the King. This is my favorite movie in the trilogy so I was hoping for a little more action. Thankfully, Tolkien delivered in spade here. While the first two books spend a great deal of time walking and looking around, the third book has epic battles, valiant speeches and loads of action. This book continued to confuse me with the multiple names (Strider is Aragorn but also King Elessar) and the names which are very similar (hello Eowyn and Eomer!) but finally I watched Frodo drop that dang ring into the Fires of Mordor!!! The hands down absolute best moments for me were the fifty or so pages after the destruction of the ring and the crowing of the King where the Hobbits return to the Shire. These scenes were not in any of the movies and I loved seeing the completely transformed Hobbits go forth in defense of their home without any aid and triumph. My favorite character was and always will be Legolas. However, I don’t know that I would have noticed him if not for the movies. Truthfully, I would never have read these books but for the movies because the whole thing sounded wretched to me. But, I am so glad that I did. The hero of this story is absolutely, hands down, Samwise Gamgee. I aspire to be as good a person, as strong a character and as supportive a friend as Sam. Have you read LOTR? Who is your favorite character? I want a robot. I’m absolutely willing to take the risk that my AI robot might one day imprison me for my safety so that I can have a robot friend. I have one of those vacuum robots and I named him, I talk to him, and he is my tiny friend. Middle Grade books like The Wild Robot and The Wild Robot Escapes only encourage me to believe that one day I will be able to have a smart and kind robotic friend. The Wild Robot introduces readers to robot Roz. After being shipwrecked on an island Roz awakens for the first time alone and surrounded by wilderness. As a robot she knows that she must have a purpose but what is it? She battles storms and dangerous animal attacks on the island before she understands that she must adapt to her environment in order to survive. As she begins to learn the language of the animals, make friends and form connections, the island starts to feel like home. But then, Roz’s past comes back to haunt her. The Wild Robot is lauded as a wonderful for examining where technology and nature overlap. However, the more profound aspect of this book for me, and the children I have read it to, it Roz’s struggle to fit in. Children have told me that Roz is like being a new kid in class, an immigrant in a new country, or someone learning a new language. All of these important issues came to these middle grade readers while watching Roz try to adapt to her wild environment. And, for me, I strongly identified with the cultural and social struggle that accompanies learning a new language. The Wild Robot Escapes begins with Roz on a farm. As she meets the owner of the farm and his two young children she tries to hatch a plan to return to her wild island and her animal family and friends. But how will a wild robot adapt to working in a civilized situation? As a sequel, The Wild Robot Escapes is almost as enjoyable as the first book because Brown created, in Roz, a character that the reader cares about deeply. It is slower to start but when the action does begin it is incredibly fast paced – especially for a middle grade book. Roz continues to struggle through situations where she begins as an outsider and has to work to be considered part of her community. The real question starts to become, will Roz be able to leave this new home to return to her wild island? In both The Wild Robot, but even more so in The Wild Robot Escapes, we see Roz using two things in order to make friends and belong: kindness and honesty. In so many middle grade books the parents are removed from the story so that the child can be the in charge of the action. But Brown’s use of an innocent robot has made for a unique protagonist that is simultaneously wise and immature. But Roz is smart enough to be honest and mature enough to be kind and those two things work for her over time. Middle grade books are a perfect reminder of the difficulties children face. And these two books arm us with a story that explains how it feels to not fit in, how a person can cope with those feelings, what is our higher purpose, and how using kindness and truthfulness will help us become who we want to be in the end. Do you read middle grade books? Why?